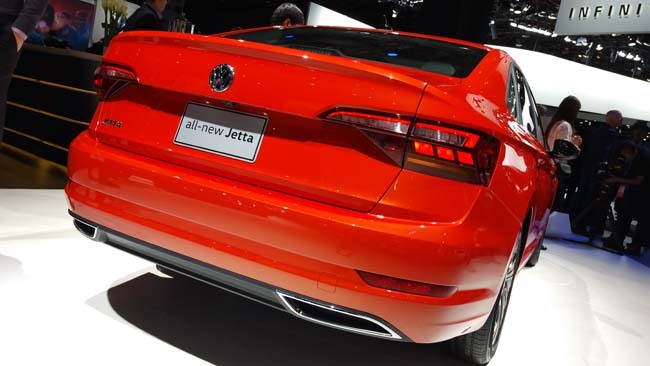 The 2019 Volkswagen Jetta sedan was revealed at the 2018 Detroit auto show and the biggest news of the reveal is a what consumers won’t see. The latest VW Jetta ditches the made for America platform of the outgoing model and adopts the Global MQB platform that most all other VW models utilize. 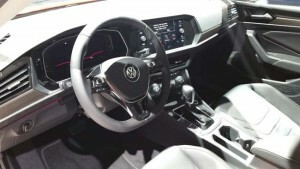 The variable platform helps to explain the changes to the 2019 VW Jetta’s dimensions. The new Jetta has a wheelbase 33mm longer than the 2018 model and overall the new Jetta is longer, wider and taller than last years model. Visually the 2019 VW Jetta has adopted a good dose of its upscale cousin’s (Audi) styling cues. The new sheet metal improves upon the almost utilitarian flat sided approach used on the previous generation and adopts some pretty interesting front and rear LED lighting treatments also. Mechanically, Volkswagen has opted to retain a solid axle in the rear suspension as opposed to the independent suspension components found on the Golf and what most enthusiasts identify with superior handling. Volkswagen has commented that they have found a satisfactory suspension setup to satisfy traditional Volkswagen drivers. The new VW Jetta will be powered by a 1.4L turbo-charged, direct injection, 4-cylinder engine. The power-plant produces 147 horsepower and 184lb.-ft. of torque. A pleasant surprise is the 6-speed manual transmission offered along with an 8-speed automatic. Manual transmissions are increasingly difficult to find. According to sources, Volkswagen Canada will not be offering the Trendline model in Canada and instead will offer entry level models in Comfortline trim and top out with Highline trim models. Expect a starting price of about $20,000 when the vehicles come to market in the Spring of 2018. Full details will be available once we are able to test drive the new Jetta.